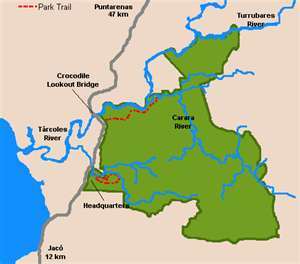 Carara National Park is a National Park in the Central Pacific Conservation Area located near the Pacific coast ofCosta Rica. Carara National Park was established on April 27, 1978 as a biological reserve, but its growing popularity after 1990 forced the government to upgrade its category to national park due to the massive numbers of tourist that visited it. Thus on November 1998 Carara was upgraded to national park category. Carara lies about 30 miles west of the Costa Rican capital of San José and about 15 miles north of the beach town of Jaco. The park protects the river basin of the River Tárcoles, near Orotina and includes one of the largest remaining populations of wild Scarlet Macaw in the country. 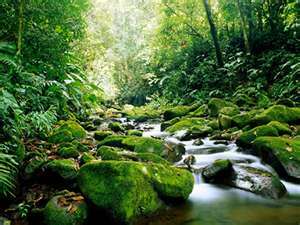 Carara National Park contains more primary rainforest than the relatively close Manuel Antonio National Park. As such, it is wetter than the more popular Manuel Antonio National Park, and has denser tree growth and moremosquitoes and other insects. The dense tree growth makes Carara a haven for many bird species, and the park is a popular birdwatching destination. In addition to Scarlet Macaws, birds found in Carara include orange-chinned parakeets and otherparrots, hummingbirds, woodpeckers, motmots, jacamars, manakins, antbirds, and several species of trogon, including the black-throated trogon. Several species of water birds inhabit the park as well. These include theanhinga, several species of heron, several species of egret and kingfishers. Among the reptiles present in the park are the American crocodile and several snake and lizard species. Green and black poison arrow frogs are among the amphibians present. Mammals include white-tailed deer, red brockets,collared peccaries, agouti, kinkajous, white-faced capuchin monkeys, mantled howler monkeys, Hoffmann's two-toed sloths and brown-throated three-toed sloths. However, mammals can be difficult to see due to the dense tree cover.